I’ve been craving burgers lately. Like, a lot. Apparently, eating In-N-Out on the weekends while watching playoff hockey has not been enough. I NEED MOREEEE BURGERS!!! So on one of my off Fridays, Henry and I headed to DLTA to try UMAMIcatessen, a food-court-esque eatery, which houses UMAMI Burger (yes, I’m totally stating the obvious :P). Having never eaten at UMAMI, we both wanted to see if the burgers were worth all the hype. 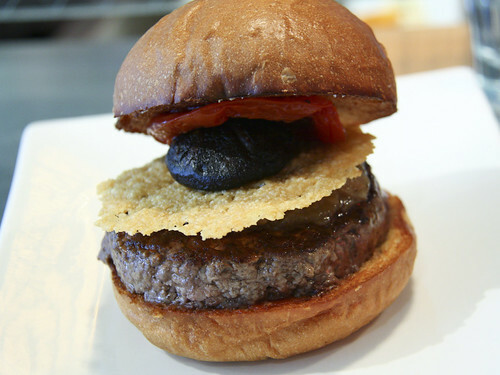 As we looked over the menu, we knew we had to try their signature burger, the Umami Burger. Choosing our 2nd burger was tough. We were interested in both the Manly and Hatch Burgers. This was a battle of bacon vs. chiles, which we both LOVE, but ultimately, bacon won, as it usually always does. Always. We ordered the burgers medium rare, as suggested by our waiter, but when we split the burgers, the patties looked more like medium, almost medium-well. 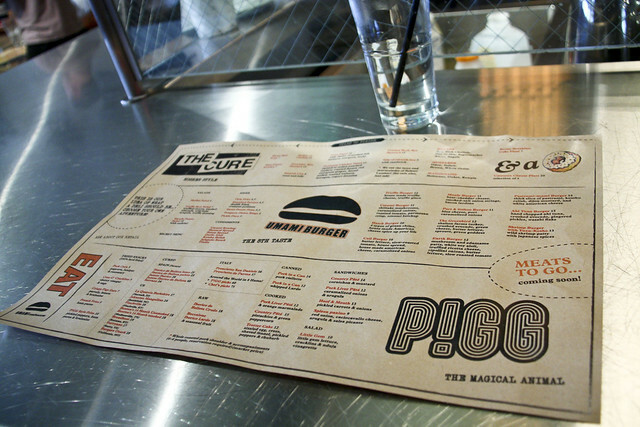 I couldn’t really complain because the burgers were actually incredibly tender and juicy. To my surprise, I liked the Manly burger a lot more than the Umami. 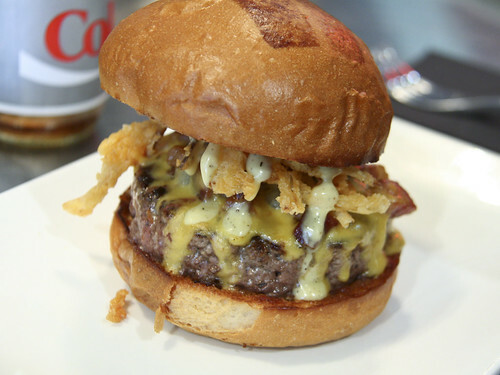 Simply put, the Manly is a high end, refined version of a Western Bacon Cheeseburger. I really enjoyed the combination of smoky + sweet and the contrast in texture provided by the fried onion. Unfortunately, I was not impressed with the Umami Burger. The flavors just didn’t mesh well and I did not care for the roasted tomato or the Umami ketchup. Am I only one??!! I’ve read many reviews raving about the ketchup. In addition to the burgers, we also ordered two sides. 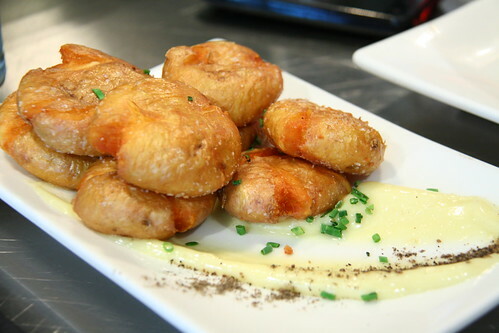 If you love potatoes as much as I do, you must order the smushed potatoes. Starchy, salty goodness! 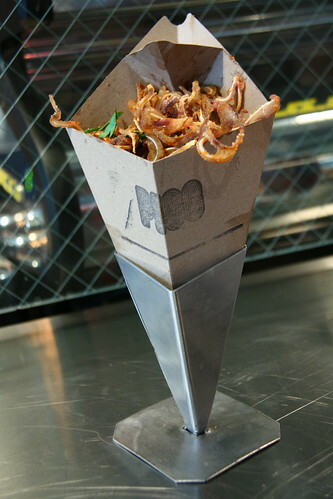 And if you’ve never had pig ears and are feeling adventurous, I recommend the crispy pig ears; they’re a great alternative to fries. I gotta say, even though UMAMI is a burger joint, I was most excited about dessert. 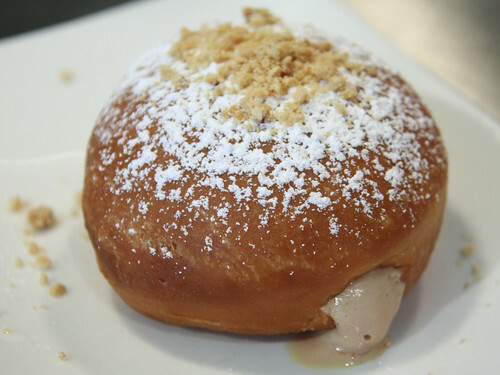 I love foie gras and I love doughnuts so the FG&J sounded amazing on paper. After a lengthy wait (longer than we waited for our burgers), I took one bite and was immediately turned off. My taste buds were so confused – the delicate flavor of the foie gras mixed with the tartness of the jam just didn’t make sense in my mouth. It was such a shame because the doughnut itself was quite good!